Street Race game! It is an online car racing games for PC free where kids can play for free and enjoy gaming online instantly. No need to download anything or install to play but just click, play, and get ready to perform some downright impossible stunts in action. Street Race game is an online car racing games for PC free where kids can play for free and enjoy gaming online. No need to download anything or install to play but just click, play, and get ready to perform some downright impossible stunts in action. Can you handle all of the jumps and loops that you'll find in this insane racing game? You can go ahead and enjoy the thrill just like a real car racing games online free! 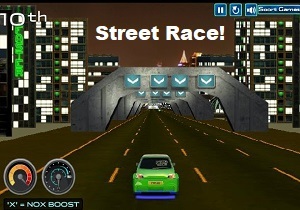 To start playing Street Race Game, you must click the continue button, then play game, then select the unlocked car and click it, (if you have money in your Cash: $, you can optionally upgrade your selected car), then click continue button, then select the place you want to join the racing competition held, then enjoy the game! Try to win the game, because you can upgrade the car every time you get a win in your round racing competition. If you win 1st, 2nd, 3rd, or any placer, you can get digital money where you can use to upgrade your favorite car. You can also buy another type and color of new car to get the more powerful car on your racing. How awesome if you get the new powerful racing car in every round of the game. Enjoy gaming online free!